JEE Mains has a reputation of most difficult to crack-down engineering entrance examination in India. It is the gateway for 12th pass students to secure admission in India’s best engineering colleges such as IITs, NITs, GFTIs and IIITs. Each year number of students taking the JEE mains is only increasing, leading to fierce and cut-throat competition amongst the candidates. This year approximately 11 lakhs students registered for JEE mains, while out of these only 2.24 lakhs will make through the second advanced level examination. Today, National Testing Agency (NTA) has successfully conducted the JEE Mains exam for both the shifts morning and evening shift. The authorities conducted the JEE Main 2019 Paper 2 on April 7 and will be conducting Paper 1 on April 8, 9, 10 and 12. The registrations for JEE Mains April attempt was started on Feb 8; the final date for application form submission was March 7. The unique thing about this year’s examination was that it was completely computerized and NTA has meritoriously made it glitch-free for the students. If you have taken this year’s JEE mains examination then, here is the in-depth JEE Mains 2019 Paper Analysis for you. The expert’s at Doubtnut sat down right after the examination and analyzed the JEE Mains question paper based on the parameters like syllabus, pattern, and level of difficulty. Keep reading the article until the end. 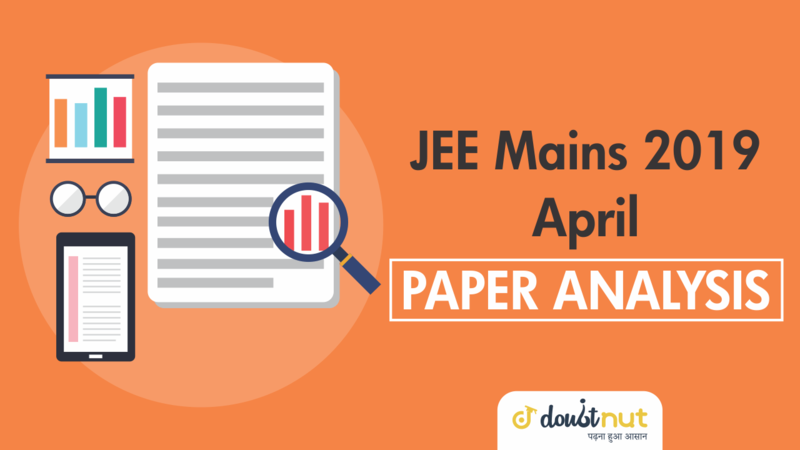 JEE Mains 2019 April Exam consists of two Papers: Paper 1 and Paper 2. The duration of both the papers was of 3 hours. Paper 1 which is for B. Tech course admission consisted of three sections: Physics, Chemistry and Maths. While, Paper 2 which is for B. Arch course consists of three sections: Aptitude, Mathematics and Drawing Section. The B. Tech course JEE mains exam consisted of 3 sections – Physics, Chemistry, and Maths. Each section had equal weightage, i.e. 30 questions worth 120 marks. For every correct answer, candidates are awarded 4 marks and wrong answer results in a deduction of 1 mark. There is no negative marking for questions that you won’t attempt. The B. Arch. course JEE mains exam paper 2 also consisted of 3 sections – Math, Aptitude and Drawing. It was partly computer-based for maths and aptitude section and partly pen and paper-based for drawing. Download JEE Main 2019 Solution for both January and April exams here. Team doubtnut.com has prepared their complete JEE Mains 2019 Question Paper PDF solutions to help students evaluate their exam preparation. Soon after the exam, JEE Mains 2019 analysis for all shifts/sets are made available on our website. The students can also download the Solutions of JEE Mains 2019 April as well as January from the links provided in the given article. Practicing given JEE Mains 2019 Question Paper PDF will help you get familiar with the exam pattern, difficulty level and will boost your confidence to attempt better in JEE advanced level. You will get acquainted with the exam type questions and fundamental concepts important for the examination. Therefore, we recommend students to download all the JEE Mains 2019 Question Paper PDF and practice. There are important psychological benefits of solving question papers in a restricted time frame. It will give you an in-house experience of the real exam scenario. This ultimately, will prove out to be of great help to attempt the actual exam with more confidence. Find here fastest published JEE Mains 2019 Question Paper with Solutions for April session. The first session of JEE Mains was already concluded in the January. Currently it is the second session of JEE Mains April going on. The JEE Mains April 2019 examination is expected to have similar question paper pattern as that of JEE Mains January 2019 with a few changes here and there. Therefore, to accelerate your preparation our JEE examination experts have analyzed, reviewed and provided in- depth JEE Main 2019 Solution for both January and April session here. Why you must solve JEE Mains Question Paper? JEE Mains question paper solutions are important to get idea of exam style expected questions. It will assist you in analyzing your preparations. Question papers help highlighting your weaker sections. It introduces students with the real-time examination experience. It improves your question solving promptness, proficiency and time management skills. Team doubtnut.com recorded the student's reaction outside the various examination centres in New Delhi. Based on the JEE Mains 2019 Student’s reactions the analysis on this page has been provided. The JEE Mains 2019 April Paper 1 is conducting in multiple shifts. The JEE Main Exam Dates for Paper 1 is from 8th April to 12th April 2019. Each day the paper is conducted in two shifts. First shift is conducted in morning sessions from 9:30 am to 12:30 pm and Second shift are conducted in the afternoon session from 2:30 pm to 5:30 pm. Candidates can check here last year subject wise Analysis of JEE Mains 2019 exams. Physics was the most difficult section. A number of questions were based on numerical making this section comparatively lengthy. The questions were more from class 11th than class 12th. Although problems may seem easy to resolve, the choices given were tricky to conclude upon. Students might have faced a hard time in understanding some of the questions. Thus, making this section time-consuming. Although nothing was found out of the NCERT syllabus. This section had been a breeze for students to complete. A number of questions were simple theory based. Students who would have scored in this section might have a chance to make it through the examination. As you can see in the below table, the physical chemistry and Organic Chemistry questions were more in comparison to inorganic. In chemistry 2 to 3 questions were repeated to a greater extent from the last year paper. Mathematics mostly had calculation-based questions making it lengthier in comparison to the other two sections. It was also quite competitive in comparison. However, the questions were easy to resolve by applying short-cut tricks and formulas. The questions were almost equally distributed from class 11th and 12th syllabus. More questions were asked from the calculus, Algebra, Vector 3D and Comics etc. Mostly new questions were asked from this section. The NTA conducted the JEE Mains 2019 April Paper 2 Exam on 7th April 2019. The Paper 2 is for B. Arch course and had 3 sections: Aptitude, Mathematics and Drawing Section. It was conducted in 2 shifts: Shift 1 from 9:30 am to 12:30 pm and Shift 2 from 2:30 pm to 5:30 pm. JEE Mains 2019 Paper 2 Analysis will be updated soon. Students who appeared in the examination must be eager to find out the expected cut-off to match their score. As per our examination experts, the JEE mains examination was moderately difficult. However, you need to wait for the result to be out as JEE Mains Cut-off can be known only after the result. JEE Main is finally over. While the exam syllabus had nothing new, but the conducting authority being NTA and the overall process of the examination was entirely new. This year NTA even gave students a choice to appear for the examination on the date of their preference. The examination was completely computer based. It has made evaluation and result process almost instantaneous. Coming out of the various examination centres , students gave quite a mixed reaction. Overall it can be concluded that the examination was tough in comparison to when JEE conducted it last year. Physics section was said to be the toughest by many candidates. While some students claimed that the Maths section was rather unexpectedly lengthy. Nevertheless, the response was much like it usually is…nothing was too easy! As for the difficulty level, the general verdict was that the JEE Mains paper was hard. JEE Mains is conducted by NTA from 8th January 2019 to 12th January 2019. It includes two Papers. Paper1 is for Btech course and Paper 2 is for B.Arch course. Paper 2 will conduct on 8th January 2019 and Paper 1 will conduct from 9th January to 12th January. The exam will be Computer based mode. JEE Mains 2019 Analysis will be made available after the exams. Candidates who are appearing for exams can check the analysis of JEE Mains 2019 Paper. As JEE Mains is conducting in Multiple sessions so datewise analysis will be made available for the Candidates. Through Analysis Candidates will get an idea about the pattern of questions, difficulty level, cutoff and weightage etc. They will get to know about their performance. From 2019 onwards JEE Mains will be conducted twice a year first in the month of march and second in the month of April. As per the previous year Analysis for JEE Mains by different coaching institutes the level of the questions was moderate. Chemistry section was the most difficult section and Physics was moderate difficult and Mathematics was the easiest from all the three sections. Most of the Questions were NCERT based. But some of the questions were tricky. Candidates are advised to focus on all the three sections of the exams. The level of the questions was moderate difficult or The level of difficulty for JEE Mains 2018 was higher than that of 2017. If we talk individually , Chemistry was the most easiest and scoring section.But for some students it was toughest. Most of the Candidates found that Physics was the difficult sections as it was taking lot of time in solving few questions. Mathematics Section was moderate difficult as questions. The paper was lengthy because of calculations. The weightage of Class 11 and Class 12 in exams was almost the same. At Doubtnut, we strive to facilitate the easy and rightful access to quality study materials to students of all age groups. You can also download our App “DOUBTNUT” from Google play store. With the highest 4.4 play store rating, DOUBTNUT App is the student's favorite e-learning destination to prepare for competitive and board examination. Keep visiting Doubtnut for interactive study material!